Extending the License Period. - Details of an answer | Buffalo Inc. If you have added antivirus software to a TeraStation that didn't come with a license for antivirus updates. To extend the update period for a TeraStation whose license for updates has expired. To add update capability to a TeraStation that didn't come with a license for software updates, please purchase a Buffalo OP-TSVC license pack (sold separately). OP-TSVC license packs can also be used to extend the license period for TeraStations whose antivirus update period has expired. Not all TeraStation can run antivirus software. Do not buy a license pack until you're sure that your TeraStation is antivirus-capable. To add antivirus support to a TeraStation that didn't come with it, you must install an updated firmware. The OP-TSVC license pack does not add antivirus support to a TeraStation. It only adds update capability. Antivirus software on a TeraStation can remain active for up to 5 years. You will not be able to extend the license period beyond 5 years total. Open Trend Micro NAS Security settings. From the left-side menu, choose [Administration]-[Product License]. Enter the serial number from the "Trend Micro NAS SecurityTM License Pack GUIDE", included in your OS-TSVC package. Click [Activate]. This completes the procedure for extending the license period. 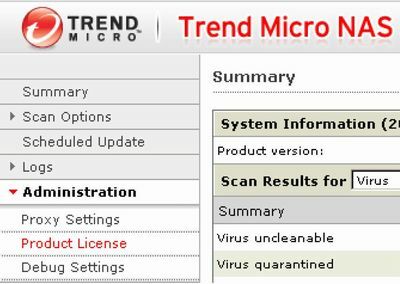 To check the status of the current license, open the Trend Micro NAS Security settings page and select [Administration]-[Product License] from the left-side menu.